FIGHT!‘s “Alright Guy” Duane Finley goes toe-to-toe with FIGHT!‘s “Canadian Guy” E. Spencer Kyte in a UFC 165 Faceoff. For this installment, Finley and Kyte take on the UFC Interim Bantamweight Title fight between Eddie Wineland and Champion Renan Barao. It was there—in one glistening moment—I had the FIGHT! Magazine Faceoff Title in my hands. But just as the glory and lust for power overwhelmed me, the belt vanished as Ronaldo Souza punished Yushin Okami at UFC Fight Night 28 earlier this month. Redemption is mine this weekend, as Brazilian smashing machine Renan Barao has been selected to be my harbinger of violence. 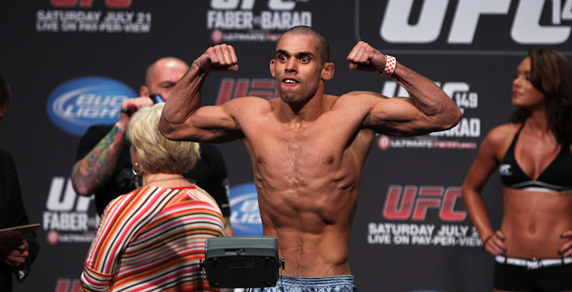 At 26-years-old, Barao is already one of the most well-rounded fighters in the game. Since joining the Zuffa fold in 2010, the Nova Uniao product has collected seven consecutive victories, four of which came by way of finish. All four of those finishes came via submission, and for a fighter who is heralded as one of the best strikers in the lighter weight classes, that’s a truly frightening detail. The reigning and defending 135-pound Interim Champion has been more impressive with every outing and has shown zero weaknesses in his game inside the Octagon. Barao turned heads in a big way during his most recent showing when he steamrolled then submitted highly-touted prospect Michael McDonald in their championship tilt at UFC on Fuel TV 7 in February. The Andre Pedeneiras-trained fighter used his striking to keep “Mayday” on the run and then activated his gorilla-strength jiu-jitsu powers to finish off the young Californian with an arm-triangle choke in the fourth round. With Dominick Cruz still sidelined and a unification bout impossible, the UFC tapped Wineland to take a shot at derailing the bantamweight phenom. While the northwest Indiana native is tough as hell, Barao is simply too good in every department and will have the ability to end the fight in a variety of fashions on Saturday night. Where I could spend time digging deeper into the areas Barao outshines Wineland in the skills department, to make the simple case, I’m going to turn to the ever-popular phenomenon of “MMA Math.” For those reading this who may not know what I’m talking about, “MMA Math” is using the outcomes of past matchups against opponents they have both faced. Wineland and Barao have both faced Urijah Faber and Brad Pickett. While Barao peppered “The California Kid” from pillar to post during their five-round affair at UFC 149, Wineland came out on the end of a lopsided beating when he tangled with Faber. As for Pickett, both Barao and Wineland were able to best the heavy-handed Brit, but the Brazilian was able to do so in definitive fashion as he submitted “One Punch,” where Wineland was forced to go to the judge’s cards to get the nod. While “MMA Math” is hardly foolproof, those previously mentioned fight show glaring differences between the two fighters. Wineland likes the ruckus to be scrappy and gritty, and he will certainly find an opponent to oblige him in those wants in Barao. The Interim Champion works with measured aggression, and once he puts the power on Wineland, a trip to the canvas will quickly follow. There is no doubting the fact Wineland has great hips and solid wrestling skills, but Barao is a different animal, and will get the fight to the ground in Toronto. Once the action hits the mat, it will only be a matter of time before Wineland becomes the 31st consecutive fighter to come out on the business end against Barao. I’m back in possession of the FIGHT! Magazine Faceoff Championship, and after Saturday night, I think Eddie Wineland is going to be back in possession of championship gold in the bantamweight division. Wineland was actually the inaugural WEC Bantamweight Champion, earning the belt with a first-round knockout win over Antonio Banuelos all the way back in 2006. He dropped the title to Chase Beebe in his first defense, and kind of fell off the radar for a couple years, but he’s been back in the mix, and I think we’re going to see an upset in the championship co-main event. I think Barao is a phenomenal talent, and I’m taking a risk by rolling with the challenger here, but I don’t want to hear Finley cry about me getting easy wins and protecting my title. And I think Wineland has the right tools to dethrone the Brazilian standout on Saturday. For the record, I also picked Michael McDonald to dethrone Barao when they fought in February, and that’s actually part of the reason I’m siding with Wineland here. Not to make up for being wrong last time, but because I think the Chesteron, Indiana, resident has a comparable skill set to “Mayday,” and is actually better in the areas where McDonald came up short against Barao in London. Where McDonald was hesitant to pull the trigger, Wineland will come forward, throwing hands right out of the gate, willing to get in Barao’s face and push the action. Should the Champion look to turn this into a grappling match, he’ll have a tougher time putting Wineland on the canvas than he did dragging McDonald to the ground. The problem with Finely’s “MMA Math” argument—besides the fact that he’s using “MMA Math” to argue his case—is that (1) Wineland actually won the first round against Faber and was in no way dominated, and (2) he and Barao faced very different versions of Brad Pickett. Wineland fought him three fights after his Brazilian opponent, when the Brit had been competing steadily without injury issues. Barao faced him off an 11-month layoff caused by a reoccurring issue with a herniated disc in his back. This pick is me playing a hunch—taking a chance on a veteran competitor who has looked very good in his last two outings. Wineland is going to put it all together at the right time to recapture championship gold. And if I’m wrong this time, Finley can savor his win and stroll around Indiana with the FIGHT! Magazine Faceoff Championship belt around his waist a la Timmy Sylvia back in the day.